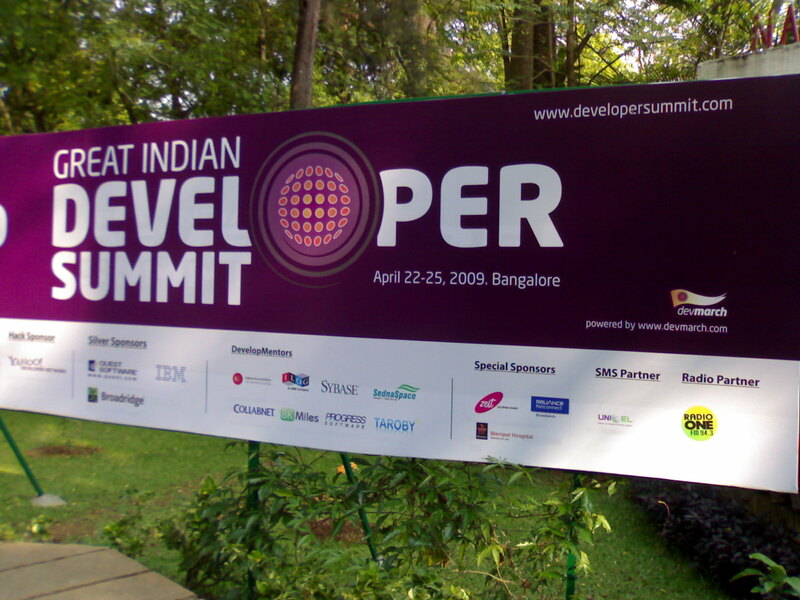 This was the last day of the Great Indian Developer Summit-2009. There were 15 workshops running in parallel at 4 different halls. Workshops covered areas like JRuby, DSLs, Silverlight, Oslo, .Net, Hibernate, Adone Flash platform, COBOL among others. The first workshop I attended was “Developing external DSLs in Java” and was taken by Venkat Subramaniam who is regarded as the languages geek. He spoke about the need for Domain Specific Languages(DSL), different types of DSLs which include Internal DSL and External DSL. He told that internal DSLs can be created by using languages like Groovy, Ruby among others and External DSLs can be created using languages with higher parsing abilities like Java, C++, C#. Internal DSLs are also called as embedded DSL. He aslo threw some light on EasyB which is basically a behavior oriented design tool. He spoke at lenght on how to use Java to create external DSL using xText and Eclipse. He later gave a demo on using xText and created a game DSL. Sadly i couldn’t work it out on my comp as I did not have xText plugin installed in Eclipse. The second workshop was “Introduction to JRuby” delivered by Ola Bini, who is one of the core developers of JRuby. He started with speaking about Ruby and JRuby features which was a repitition for me as i had attended his JRuby talk the other day. 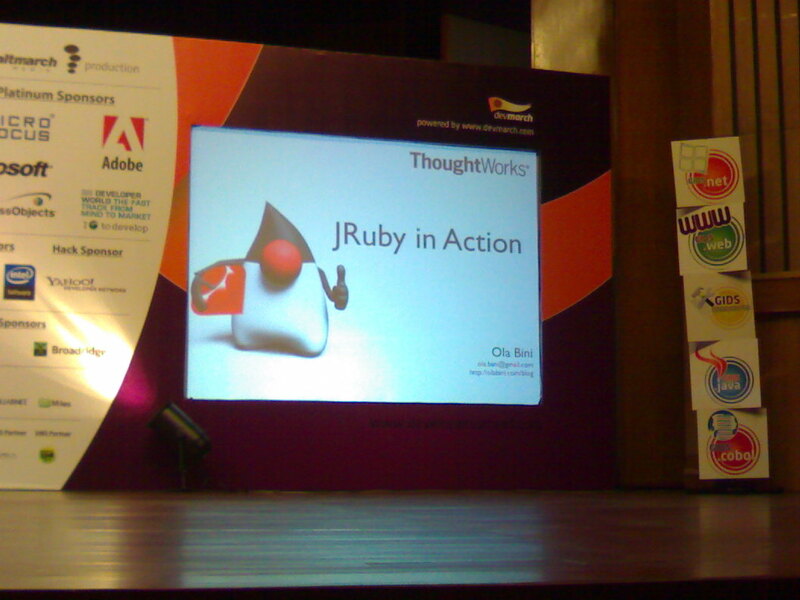 As he went ahead with his talk, I was busy configuring my Linux for running JRuby applications. Once he started writing some code i followed the same and got some taste of Ruby and JRuby. As the session progressed he went into much higher aspects of JRuby and finally spent some time explaining Ruby on Rails. RoR was the reason why Ruby developed interest which wasn’t there before though Ruby was much older than Java. Using RoR was similar to that of using Grails so there wasn’t much difficulty in getting the general idea but the Ruby related aspects were tough to digest. But i really appreciate and admire the languages Groovy and Ruby for they have added Elegance to the programming which was earlier very verbose thanks to Java ;). Though I really like the way Java is but once i was introduced to Groovy and Ruby, Java seemed like C to me. 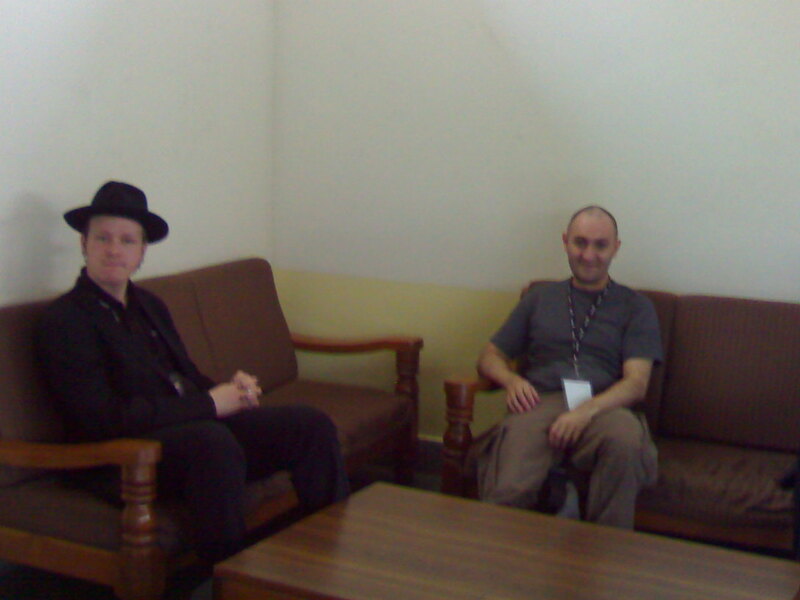 GIDS-2008 and GIDS-2009 have been great learning experiences for me. Listening to best speakers from around the world and there were ocassions when the creators of the technology spoke about their creation. Its feels really great to listen to the creators themselves. The only thing i would want to change in the Great Indian Developer Summit is that they should be introducing some concesison for the student community because that is the heart of action. Though we students may not be experienced with new technologies but surely after listening to such great speakers will instill the desire to learn. GIDS is really a great initiative from Saltmarch media and I am looking forward to attending GIDS-2010 [This was the same thing i had written in my blog about the last edition ;)]. 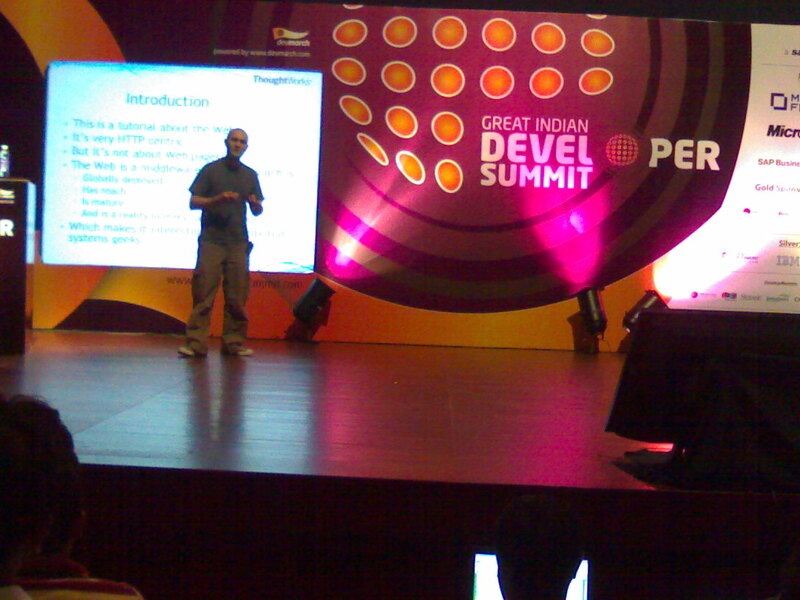 GIDS- Great Indian Developer Summit. 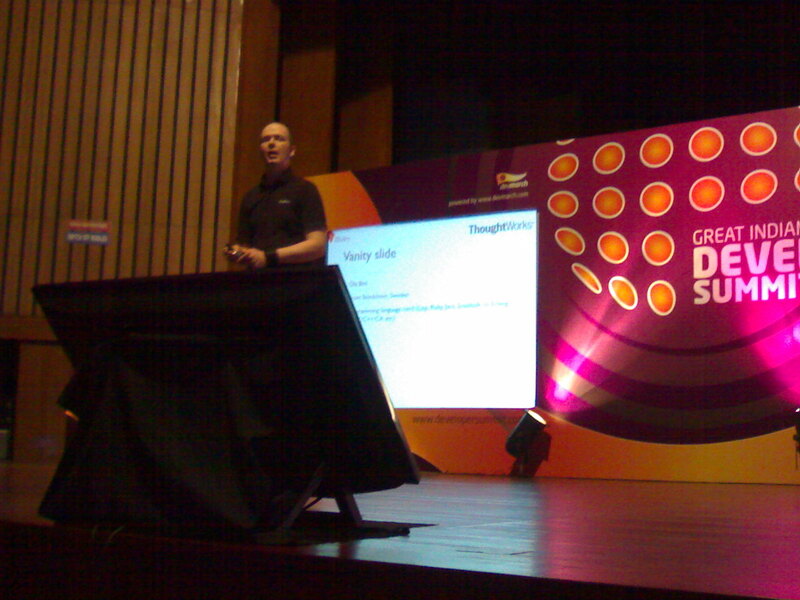 My experiences at GIDS-2008 can be read here, here and here. 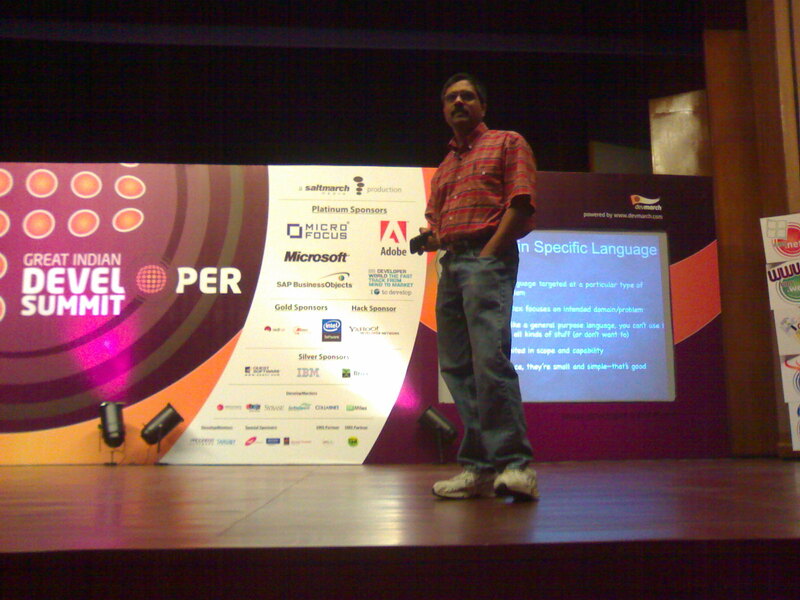 My experiences at GIDS-2009 can be read here and here. I chanced upon your blog and found it very informative. The event blogs are striking enough to have a feel of the event, so, I would like to have a little chit-chat on your blogging interests. And even we are coming up with an event on startups on June 6th in Bangalore. So, can I have your contact details? Looking forward to hear from you.